Year round access and drilling. Underexplored area hosting the Éléonore gold mine along strike. 23 km along the contact between sediments and volcanics between La Grande and Opinaca sub-provinces. 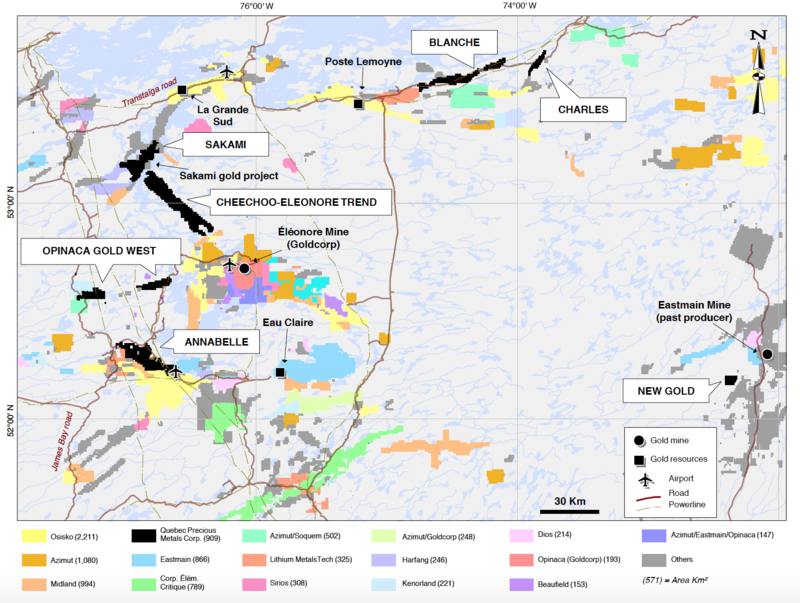 Many gold occurrences identified over 10-km strike length. Early 2000s: mineralization discovered at surface near Sakami Lake. Until 2017: Drilling over 700 m length, down-plunge from surface to 550 m, open in all directions. In 2018 a total of 7,226 m of drilling was completed in 21 drill holes. 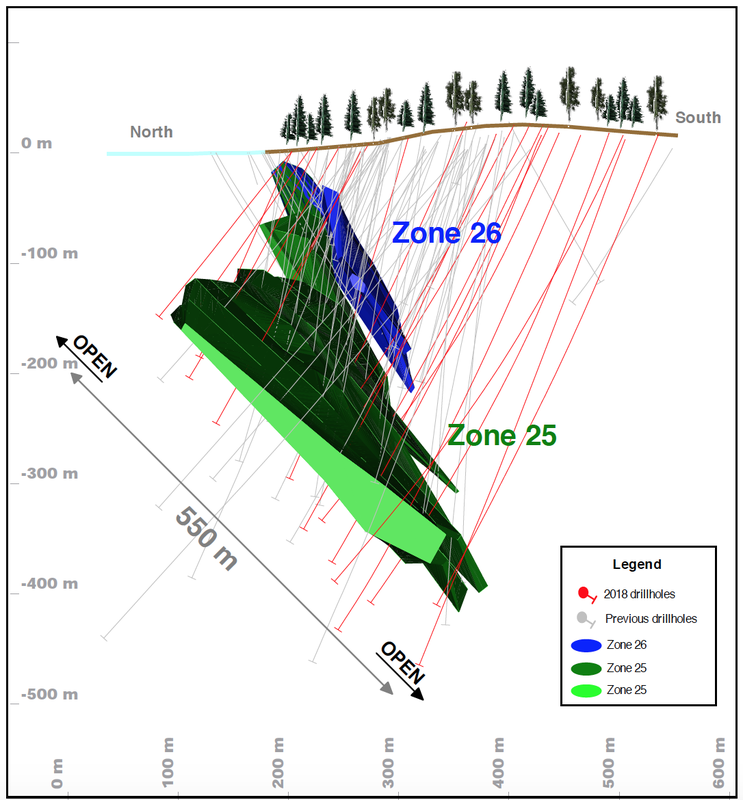 The last hole of the campaign (PT-18-127) ended in mineralization with 2.04 g/t Au over 2.5 m. This is one of the deepest holes drilled suggesting potential for further extending mineralization at depth. The possibility to re-enter the hole to test the full extent of the mineralization will be evaluated. 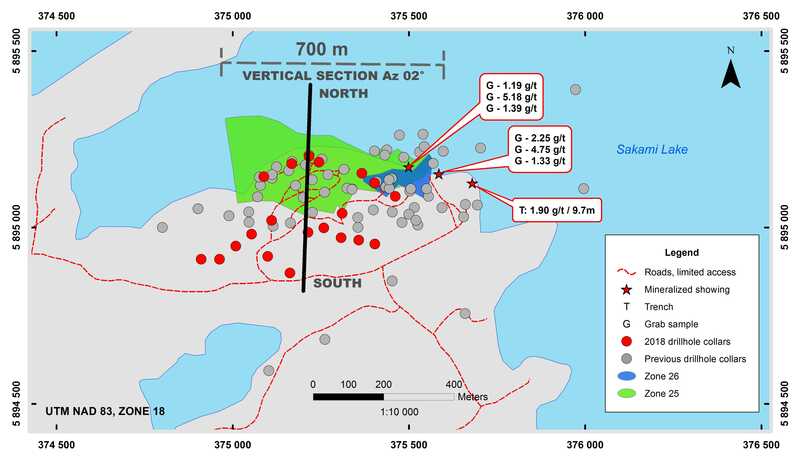 * The text on this page includes information extracted from the NI 43-101 technical report prepared by SGS Canada Inc.’s Geostat consulting Group on the Sakami project and dated November 24, 2017. The focus of recent surface work has been the La Pointe (Zone 25 and 26), JR, showings 9.6 and 43 sectors. Drilling has focused on the La Pointe sector in which gold occurs at the subprovinces contact in association with structural deformation. A mineralized area has been outlined of 800 m long by 550 m wide along dip and to a depth of 400 m below surface.